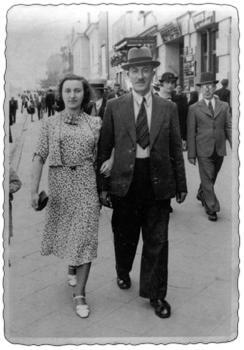 Holocaust Survivors: Photo Gallery - "Manya and Her Father"
On a Saturday, Manya and Simon Sher go for a walk on the main street of Czestochowa. On Shabbos the Sher's would dress in their best clothes to go to synagogue and go walking afterwards. Street photographers would take portraits of the passersby on speculation and attempt to sell them later.